So I live in the southern hemisphere! We currently are in the middle of Summer though it's been a surprisingly mild summer so far! But WHY oh why do I have to fall in love with designs that just do not work with my climate! But snow in the middle of January? This would never suit my house! But it's such a gorgeous design, and I can't use it! I can't even buy them all and mix up the month names because we don't even get snow in winter here. We freeze before it even gets close to 0 degrees. So instead I am not going to buy these designs and not going to stitch them because I can't use them and they aren't relevant but they are so gorgeous I really want them! Caitlin, they are my thoughts exactly! I love this design and would dearly love to have it... maybe it would be a good one to use to stitch for an exchange partner in the Northern Hemisphere... that way, we could have the chart, enjoy the stitching and still have an appropriate use for it! Yeah, though that argument has flaws because I don't think I could part with it once I stitch it! Interesting comment. Do you have a designer in the Southerm Hemisphere who has done a calendar series. I would love to see their take on the months. I love the quilt designs and stumpwork from Austrailia, it would be good to get to know some cross stitching as well. LOL, I live in the Northern Hemisphere but it's all palm trees and cactus here - we were excited that we had frost last week. Just think of it an artifact from another land and stitch it anyway! Couldn't you just leave out the word January and replace it with some snowflakes? I think it would look really nice that way too. Then it would just be a pretty picture of a snowy cottage scene and not in any way related to the seasons there. hello deary, well same here..in south africa it is summer time..but i love it so much that i so much wanted to stitch it..
Well, now that's something I never thought about, that the calendar designs would be opposite for you all. We never get snow where I live either as we live in the desert. And in fact it's usually warm enough to walk around with short sleeves during our winters. I must admit I think this is a pretty cute series - couldn't you adapt it a little, miss out the snowflakes and add a big sun lol! This is so pretty! I've always wondered about people celebrating Christmas in areas with no snow....I like Joyce's suggestion. Here in northern Pennsylvania, we get our share of snow and even if we didn't, one of my favorite things are snowmen and winter designs. My bathroom is decorated in snowmen and I never take down my stitched winter pieces. I think you should dedicate a room or a wall to a winter theme. 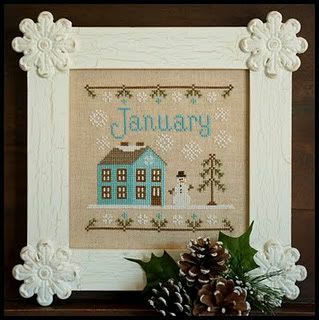 That way you have an excuse to stitch fun winter designs. That is such a shame that there are no calendar patterns made up for the OTHER half of the world, with summer in January and winter in July! I sure am sorry they forgot about you guys down there!! If I were you, I would change the names of the months around and stitch them all anyway!